Monday, December 10, 2012, the feast day of the Kursk-Root Icon of the Mother of God, the Protectress of the Russian diaspora, a regular session of the Synod of Bishops of the Russian Orthodox Church Outside of Russia opened with the celebration of Divine Liturgy in New York’s Cathedral of Our Lady “of the Sign.” His Eminence Metropolitan Hilarion of Eastern America and New York, First Hierarch of the Russian Church Abroad, officiated, along with His Eminence Archbishop Mark of Berlin and Germany, His Eminence Archbishop Kyrill of San Francisco and Western America, His Eminence Archbishop Justinian of Naro-Fominsk, Administrator of the Patriarchal Parishes of the USA, His Eminence Archbishop Gabriel of Montreal and Canada, His Grace Bishop Peter of Cleveland, Administrator of the Diocese of Chicago and Mid-America, His Grace Bishop George of Mayfield and His Grace Bishop Jerome of Manhattan. Before Holy Communion, Archbishop Justinian read a sermon to the many worshipers. After a moleben before the main holy icon of the Russian diaspora, Metropolitan Hilarion gave Prince Vladimir Kirillovich Galitzine, Warden of the Cathedral for many years, the Kursk-Root Icon Medal, First Degree, and Adam Nikolaevich Krotov, his colleague, a decree of blessing from the President of the Synod of Bishops. Beginning later that day, the archpastors began their meetings, hearing the report of Archbishop Mark on the Russian Ecclesiastical Mission in Jerusalem; the report of Protopriest Andre Papkov, President of the Church Liturgical Commission of the Synod of Bishops; Protopriest Andrei Sommer, Vice President of the Synodal Youth Department; Priest Nicholas Olhovsky, Caretaker of the Kursk-Root Icon of the Mother of God; Eugene Grigoriak, Treasurer of the Synod of Bishops; Deacon Ephraim Willmarth, Assistant Rector of Holy Trinity Seminary in Jordanville, NY; and members of a committee appointed by the First Hierarch to study matters concerning the building of the spiritual and administrative headquarters of our Church and possible solutions. The committee included Mark Selawry, Alexander Kulesha and Alexander Karpov, with Peter Vladimirovich Derby and Nicholas Ohotin serving as consultants.The reports were carefully heard and a serious discussion regarding many questions of church life followed. 1. To decree to the abbots and abbesses and rectors of the monasteries and parishes of the Russian Orthodox Church Outside of Russia to commemorate the Royal Passion-Bearers during the dismissal of Liturgies in the following manner: “The Holy Righteous Passion-Bearers Tsar-Martyr Nicholas, Tsarina Alexandra, Tsarevich Alexei, Tsarevnas Olga, Tatiana, Maria and Anastasia; Holy Martyrs Grand Duchess Elizabeth and Nun Barbara and those martyred with them,” to commence on January 1/14 until the end of 2013. 2. And before the veneration of the cross during the first Sunday of Great Lent, to sing Eternal Memory to the Righteous Tsars and Tsarinas of the Romanov Dynasty and to “all members of the family of the All Russian Royal House,” in accordance with the Rite of the Triumph of Orthodoxy. 3. The general celebration of the 400th anniversary of the Romanov Dynasty will be held at Holy Trinity Cathedral in Toronto, Canada, on September 5-8, 2013, to coincide with a Russian Orthodox conference and a session of the Synod of Bishops of the Russian Orthodox Church Outside of Russia. 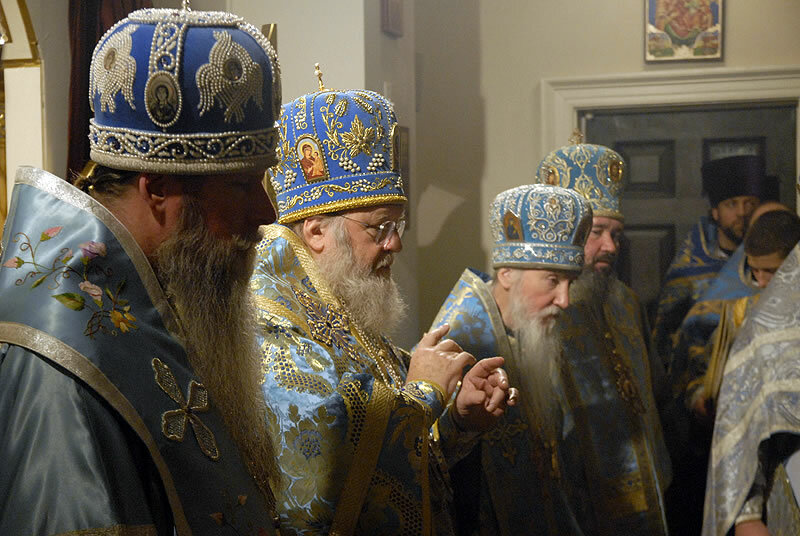 Discussing the practice of divine services in the Russian Church Abroad, the members of the Synod of Bishops noted the importance of preserving traditions inherited from the holy fathers, founders of the part of the Russian Orthodox Church located abroad, and carefully examining persons preparing for ordination into the clerical ranks and those wishing to be received into the bosom of the Russian Church Abroad. Among other administrative matters, intercessions by the archpastors for ecclesiastical awards to clergymen and laity were discussed.